To understand a particular character or person, it may be most helpful to look to their dialogue and actions for a clearer understanding. Comments, verbal expression, and conversation often reveal hints into the lives, relationships, personalities and pleasures of an individual. This feature offers you a list of the Rogue's quotations and dialogue with the other characters that are featured within "X-Men: Evolution." Some were extracted from the animated series, while an occasional few have been written up from the webmistresses' copies of the "X-Men: Evolution" comic books. Rogue: "What just happened? Where am I? Und ich verstehe Deutsche? I can speak German? The fuzzy one -- Kurt. I'm him. Just like I was Cody. I think I'm catching on now." Rogue: "Wow. Y'all really look out for each other, don't you?" Scott: "Yeah. Yeah, we do that." Rogue: "The girls are right. You are a charmer." Scott: "Look, I'm just reading the lines, okay?" 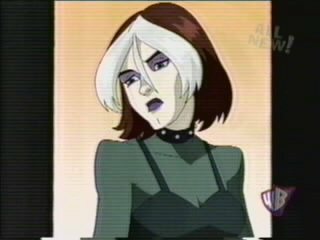 Rogue: "Yeah, I know, it's just that sometimes I wish ..."
Rogue: "Wish I could get close to somebody, but you know what happens when I do ..."
Rogue: "Leave her alone, ya yahoo!" Blob: "What are you going to do? Make me wear bad makeup?" Rogue: "Didn't Mystique tell you what my power is?" Blob: "No, 'cause I don't care!" Rogue: "My power is your power, and I can take more than one!" Blob: "I got too much power even for you. You can't hurt me. I'm the Blob!" Rogue: "Nah, you're just garbage that wanted a date, and I'll tell you I'm taking you out!" Rogue: "There you go. I only took a short-term dose of your power. You should be back to normal soon." Scott: [replies with a line from their play rehearsal] "You are like an angel, Kate." Rogue: "My name's not Kate. And I'm no angel ..."
Kurt: "What are you doing here?" Rogue: "Look who's talking. At least I didn't blow the place up." Lance: "Rogue, Mystique sent us to find you. So, you with us or them?" Scott: "Mystique? You're working for her?" Rogue: "Hey Summers. You've got your friends, I've got mine. But this ain't my fight. I'm outta here!" Rogue: [at the finish] "No trophies for second place." Scott: "How does a southern gal like you learn to handle a snowmobile?" Rogue: "... let's just say I'm full of surprises." Rogue: "Scott. Scott. Listen, just hang on, you're gonna be okay. You're gonna be ..." [looks over the edge] "Oh man! We're gonna die!" Scott: "Thanks for the pep talk. Rogue ... Thanks. You saved my life." Rogue: "I owed it to you. Mystique had me pretty mixed up. Her minds' a tortured mess, but I saw enough to know that you're not my enemy ... I really thought that she cared about me." Rogue: "Some friendly advice, 'teach; don't mess with the Rogue!" Logan: "Where's you allegiance kid, us or them?" Rogue: "If I don't say you, will I get thrown out of this jet?" Logan: "Nope, not our style. We've either earned your trust by now or we haven't." Logan: "Welcome to the X-Men." Rogue: "Just when I thought you could not possibly get more pathetic." Kitty: "At least I've got a hope of getting cast. Unlike you." Rogue: "Think about it. I was made for this play." [catches Spyke filming them] "Hey! What are you playin' at, Porcupine? I better not see my face on that tape or they're gonna be calling you Spyke-less." Evan: "Come on Rogue, get with the program. Shake that thing." Rogue: "Hey, she's got her moves, I got mine." Kitty: "Yeah girl, you gotta go with it. Y'know, you're like a walkin' zombie or something." Evan: "Hey, listen Rogue, how 'bout you shed those gloves and give K-girl a tap." Kitty and Rogue: "What? No way!" Evan: "Listen to me. Just enough to rip Kitty's moves." Rogue: "It might work. Just concentrate on 'em." Kitty: "Okay, but you better not lay me out." Kitty and Rogue: [they touch] "Whoa!" Rogue: "That was like, pretty icksome! Aww, am I talking like her?" Rogue: "I'm goin' AWOL. Anyone know how to hot wire a school bus?" Jean: "Yeah. At least he gave us a choice. Survival training here or with Wolverine." Rogue: "Going somewhere? Me and Kurt have a few questions we need you to answer." Mystique: "I'm afraid it's too late for answers. Far too late." Kurt: "I still can't believe it. Mystique is my mother?" Rogue: "Listen Kurt, who really knows? I mean, that's one seriously disturbed lady. Maybe she's just messin' with ya." Kurt: "I guess, but there is a certain resemblance ..."
Rogue: "Listen Kurt, I really do know what you're going through. We'll both keep looking and we'll find our answers together someday." Rogue: "I've been goin' into meltdown here, all covered up like this. I hate it!" Kurt: "Yeah? You should try being blue and furry. It's murder!" Jean: "It's called soccer, Mr. Gridiron, not football." Risty: "Gee, not where I'm from." [to Rogue] "Hey, Moody-Girl, what's eating you?" Rogue: "Where I'm from, people like me never party with people like them." Risty: "Is that any way to support your housemate?" Rogue: "Perky Jean's got enough people gushing over her." Rogue: [to Risty] "... and that leads us back to the foyer, where everyone forgets their manners, and just stares at you ..."
Rogue: [thinking to herself] You wouldn't treat Jean like this. Jean: "Hey, that's not true. He doesn't treat me any different than you." Rogue: [visibly upset] "Hey! Who gave you permission to go into my head?" Kurt: "Come on, we're running out of time." Rogue: [is hit, falls to the ground] "Forget it. I got hit." Scott: [abruptly slings her over his shoulder] "No one gets left behind." Scott: [at the pool deck, after a water-based training session] "Wrong victim, Alvers! And you just drowned two people!" Lance: [emerges from the pool, having been assigned to save Rogue, has Kitty in his arms instead] "Yeah, but look who I rescued!" Rogue: [passes him, abruptly shoving the both into the pool] "Creep." Rogue: "I don't like this. They're our friends." Logan: "We just gotta subdue 'em. No one has to get hurt." Scott: [as the others approach, appearing intimidating] "Yeah? Tell that to them." Rogue: [to the possessed Jean] "Oh, no you don't. This ain't going to be easy on either of us." [she touches Jean's face; they struggle and Jean collapses] "But mostly you." Rogue: [as Kitty yawns] "Not enough sleep? You and Lance were still on the phone at 1:30! So, did you ask him?" Kitty: "To the dance? No. You know what everyone around here would say." Kitty: "Hey, have you asked Scott yet? You better hurry before Jean moves in." Rogue: "Listen. The last time I danced with a guy he nearly ended up in a coma." Kitty: "But Scott knows. He won't touch you." Rogue: "No touching? Sounds like a fun way to dance, huh? I think I'll pass." News broadcaster: "... for despite their fearsome powers, most mutants look like normal citizens." Rogue: [referring to an image of herself on the station] "Normal? Look at me -- I'm fat! Do I look that fat to you? Well, I am not buying these cupcakes ..."
Student: [taunting] "Hey, what's your special power? Can you, like, read my mind?" Rogue: "Yeah, like I could find it." Student: "Clear the road, losers." Rogue: [wagging her finger at him] "Uh, I think the phrase you're lookin' for is 'pardon me'." Student: [turning around] "What was that, skunk-head?" Rogue: [stepping up to him] "Oh, you're gonna push me around, now? Please, lay a finger on me. We'll see what happens ..."
Scott: [about their game] "You whooped me good!" Rogue: "Want a rematch tomorrow night?" Scott: "Tomorrow? Sorry, that's the concert." Rogue: "So, are you going with anyone?" Scott: "Uh, yeah, with Jean." Mystique: "I know I've hurt you, but I only posed as your friend so I could be near you." Rogue: "Liar! I know the truth. You used me to spy on the X-Men ..."
Mystique: "No, it's not that simple. If you have my memories, then you know what our relationship is." Rogue: "I don't know anything." Mystique: "Admit the truth Rogue. I adopted you when you were four. Search your memories. You are my daughter." Logan: "We will Rogue, just stay calm." Rogue: "... I have no friends!" Rogue: [about Kurt with stone Mystique] "You dare bring that thing back into this house?" Kurt: "Rogue, she can't hurt us anymore." Kurt: "I know you have every reason to hate her. So do I, I mean, look what she's done to us. But still, she's our mother." Rogue: "Either you get her out of here or I will!" Kurt: "Rogue, anger and hatred destroyed her. If you don't get rid of yours, it will destroy you, too!" Rogue: "It already destroyed me." Kurt: "You did it, Rogue. The girl who shut herself off from the world just saved it." Rogue: "I wish I could say I did it for the world ..."
Scott: [after a session in the Danger Room] "Additionally, although evaded, the force fields were never technically neutralized and -- "
Rogue: [examining a beaker with fluid in it] "And it turns out that we didn't rescue any kind of special serum, either, unless there's a global lack of grape juice we're all unaware of ..."
Logan: "Stay in 'the tree' as long as you can. Imagine the sun shining down on you, a gentle breeze rustling through your leaves. Relax, Summers. Yoga isn't about trying as hard as you can, it's about accepting what you are." Rogue: "And I am so not a tree ..."
Kurt: "None of us are really trees, Rogue, but imagine maybe you are hiding and so pretending to be a tree." Rogue: "And just what kind of moron would I have to be hiding from that he might mistake me for a tree?" Kitty: "What's 'CPR' stand for again?" Rogue: [flicks her tongue out at Scott and Jean's kiss] "Convincingly Perfect Redheads ..."
Risty: "I see the way you watch him. You've got a thing for that Scott Summers guy ... and he doesn't care if we all die in a huge, fiery explosion, as long as Miss Jean Grey is still around ..."
Risty: "Isn't it? Look at him, Rogue. He's ga-ga over her ..."
Rogue: "I know. But he does care about other people. He's very caring, and he's also very nice to me." Rogue: [in the Danger Room with Scott] "Cyclops! I need some firepower over here!" Scott: [eyes shielded with an arm] "Hang tight, Rogue! Once I find my visor, I'll -- "
Rogue: [dodging the weaponry] "There's no time for that! Just turn your head to eight o'clock and let 'er rip!" Scott: "I ... I can't! I might hit you!" Rogue: "Not if you trust me! We're supposed to be a team, right? Fire at eight o'clock! Do it!" Scott: [fires at her command] "I hope you're right about this! ... Rogue? Rogue?! Ohmigod, did I blast you? ... I knew it. I knew this would happen! Only a matter of time before I hurt someone I -- " [finds his visor and puts it on] "There! Rogue, hang on! I'm -- "
Rogue: [chuckles a bit] "The look on your face?" Scott: "Wait, wh -- you were joking?" Rogue: "Couldn't resist. I don't think I've ever seen you move that fast!" Scott: "Are you nuts? I was ... I was ..."
Rogue: [earnestly] "Worried about me?" Scott: "Well, yeah. I mean, of course I was! I'd be worried about any teammate, Rogue, I have nightmares about things like this ..."
Scott: "We have no choice. We have to help Storm." Rogue: "Oh, I didn't mean that." [smirking] "I meant leaving Jean alone with that hunk ..."
Rogue: "So, what can you do?" Mutant: "They call me Tar Baby. Touch me and you won't be able to let go. I'm very sticky ..."
Rogue: [proceeds to remove a glove and nears him] "Mmm, pleased to make your acquaintance. They call me Rogue ..."